2Graduate School of Information Science, Nara Advanced Institute of Science and Technology, Ikoma, Nara, Japan. Received March 25th, 2010; revised August 25th, 2010; accepted September 16th, 2010. March 2008, far surpassing the 14,315 in July 2005.
user is a novice and his/her PTD has often failed. system. Finally, Section 7 concludes our contribution. dictive accuracy of six machine learning methods . 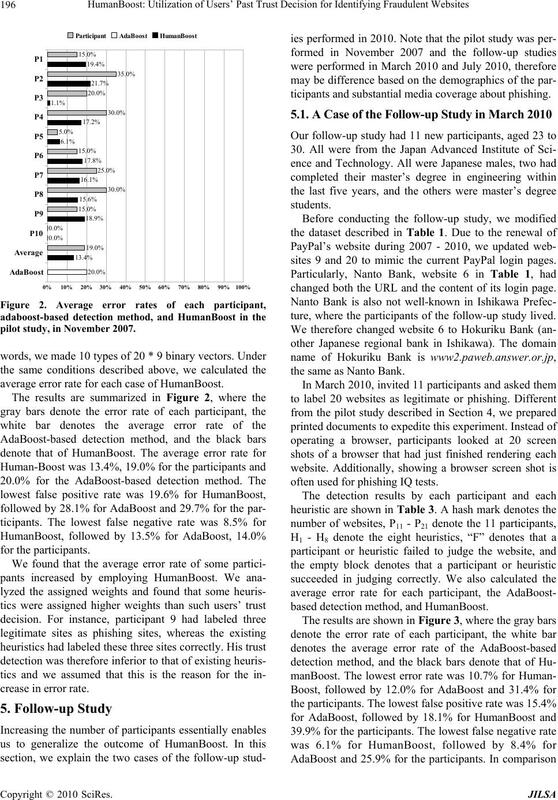 tures, and showed that the lowest error rate was 2.01%. were observed for the AdaBoost-based detection method. Figure 1. Example of PTD and its scheme. 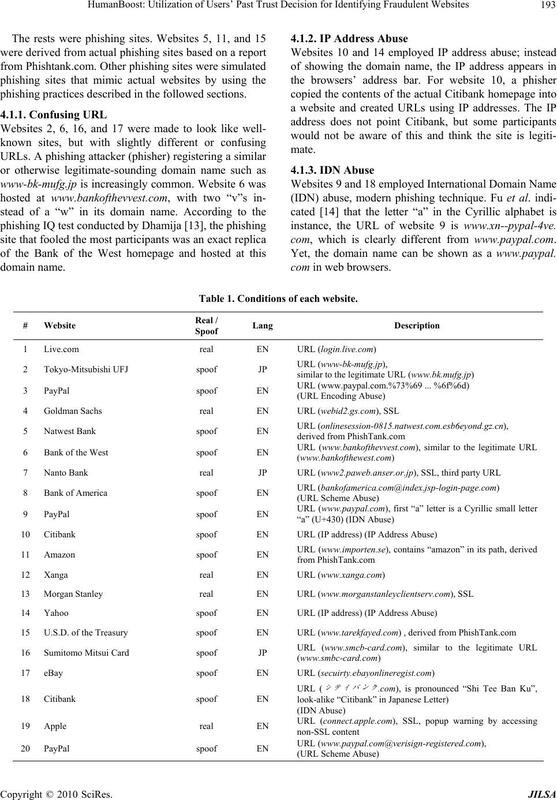 user as long as phishing attacks target individual users. learning processes describe in Section 3.2.
equally weighted so Dt (i) = 1/m. AdaBoost chooses the weight as shown in (2). it outputs the final hypothesis as shown in (1). judge a site that the user is likely to misjudge. design and finally show the results. 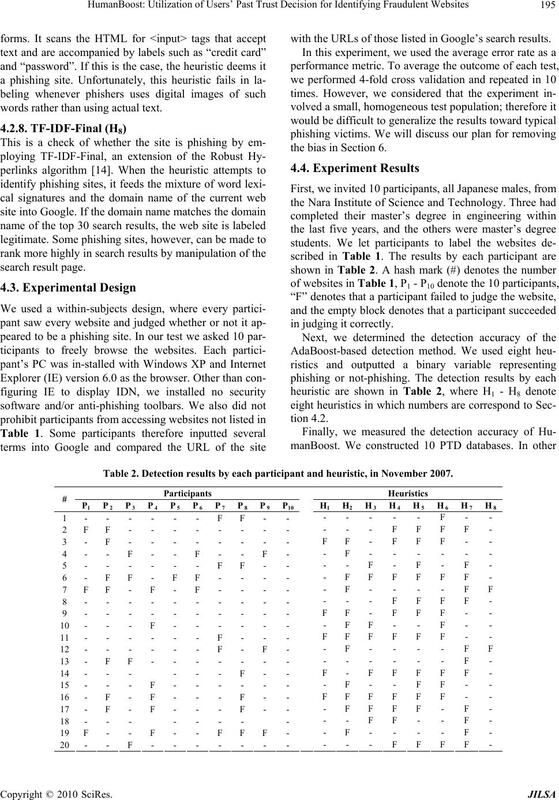 sites are shown in Table 1.
could mislead participants into labeling them as phishing. ser.or.jp which gives no indication of the bank’s name. because of its accessing non-SSL content. phishing practices described in the followed sections. instance, the URL of website 9 is www.xn--pypal-4ve. com, which is clearly different from www.paypal.com. Yet, the domain name can be shown as a www.pаypal. Table 1. Conditions of each website. mimic that of PayPal, Inc.
ago, and thus, the heuristic fails to classify it correctly. Bank, ANZ Bank, Chase Bank, and Wells Fargo Bank. an eBay domain, the heuristic deems it a phishing site. website, the heuristics labels this as a phishing site. at-mark (@) symbol or a hyphen (-) in the domain name. if a link on the page contains an at-mark or a hyphen. name, or that of a legitimate site is an IP address. legitimate sites can have five or more dots. words rather than using actual text. with the URLs of those listed in Google’s search results. the bias in Section 6. Table 2. 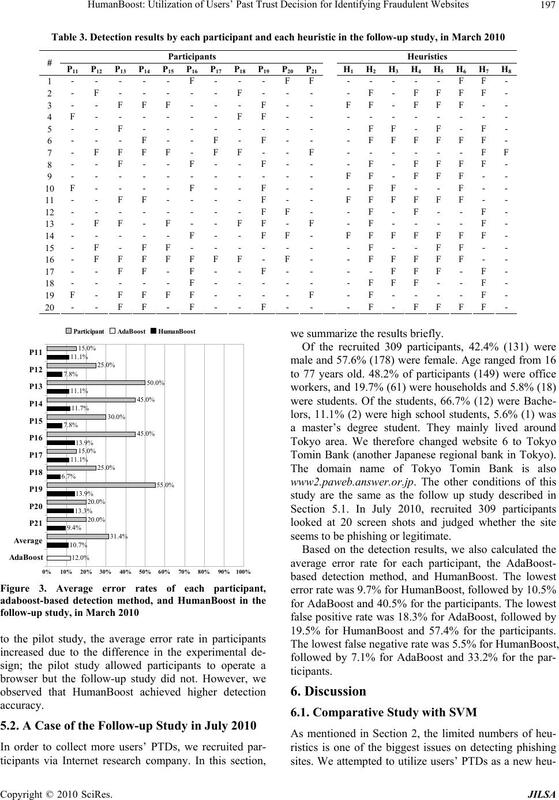 Detection results by each participant and heuristic, in November 2007.
pilot study, in November 2007.
average error rate for each case of HumanBoost. ticipants and substantial media coverage about phishing. sites 9 and 20 to mimic the current PayPal login pages. changed both the URL and the content of its login page. ture, where the participants of the follow-up study lived. the same as Nanto Bank. often used for phishing IQ tests. based detection method, and HumanBoost. we summarize the results briefly. Tomin Bank (another Japanese regional bank in Tokyo). seems to be phishing or legitimate. 19.5% for HumanBoost and 57.4% for the participants. the dataset in the pilot study, as described in Section 4.
for SVM-based detection method was 21.7%. for SVM-based detection method was 18.3%. based detection method was 18.9%. In this section, we discuss our plan for removing the bias. decided to perform a field test in a large-scale manner. tion of users to agree to use it. has been available in phishing-prevention systems. confidential information can be input to the site. messages would be shown after making the trust decision. plement such system as a browser-extension. Boost to improve the accuracy of detecting phishing sites. was similar to the output of the existing heuristics. incorporate it into eight existing heuristics. potential to improve detection accuracy for Web user. that the utilizing PTDs increased the detection accuracy. prove detection accuracy for Web user. Science and Technology for attending our experiments. age Consumer Trust in Online Commerce,” 2005. Report-Q1, 2008,” August 2008. http://www.apwg. Conference on World Wide Web, Canada, May 2007, pp. USA, October 2007, pp. 60-69. China, May 2007, pp. 639-648. Vol. 55, No. 1, August 1997, pp. 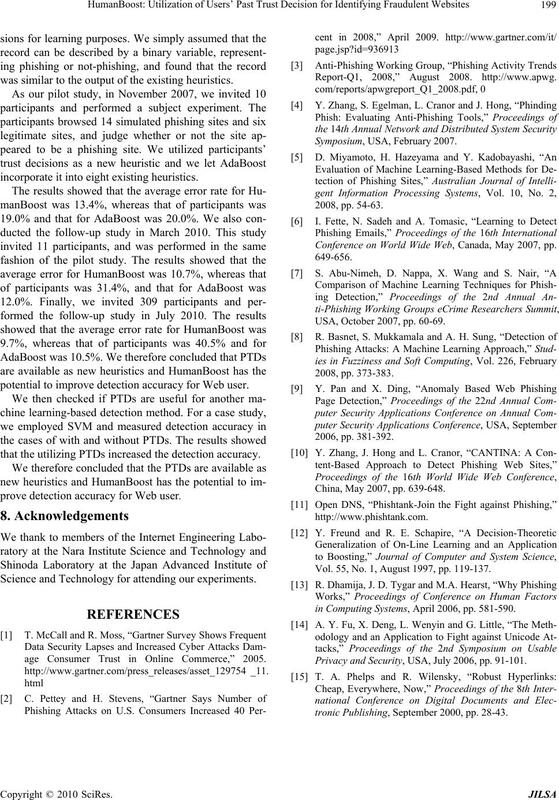 119-137.
in Computing Systems, April 2006, pp. 581-590. Privacy and Security, USA, July 2006, pp. 91-101.
tronic Publishing, September 2000, pp. 28-43.